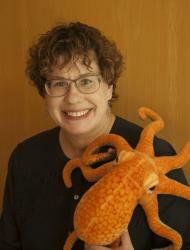 Mary is the head librarian at the Hatfield Marine Science Center (HMSC), a branch campus of OSU. Prior her time at OSU, she worked for 30 years as a science librarian, with a focus on medical libraries. Her research interests include graduate students’ needs, evidence-based medicine and developing inclusive collections. Markland, Mary J.; Rempel, Hannah Gascho; Bridges, Laurie. 2017. Mobile Website Use and Advanced Researchers: Understanding Library Users at a University Marine Sciences Branch Campus. Information Technology and Libraries. 36(4). https://doi.org/10.6017/ital.v36i4.9953. Markland, Mary J., Andrea Sevetson. 2016. Fishy Business: Fish in the United States Serial Set. IAMSLIC Conference Proceedings. https://hdl.handle.net/1912/9130. Rieke, Judith L; Safratowich, Michael; Markland, Mary J. 2009. Discover health services near you! The North Dakota story: part II. Journal of Consumer Health on the Internet. 13(3): 223 – 236. Rieke, Judith L; Safratowich, Michael; Markland, Mary J. 2009. Discover health services near you! The North Dakota story: part I. Journal of Consumer Health on the Internet. 13(2): 143 – 155. Sahmoun AE, Markland MJ, Helgerson SD. 2007. Mental health status and diabetes among Whites and Native Americans: is race an effect modifier? Journal of Health Care for the Poor and Underserved. 18(3):599-608. Crosby RD, Wonderlich SA, Mitchell JE, de Zwaan M, Engel SG, Connolly K, Flessner C, Redlin J, Markland M, Simonich H, Wright TL, Swanson JM, Taheri M. 2006. An empirical analysis of eating disorders and anxiety disorders publications (1980-2000)-part II: statistical hypothesis testing. International Journal of Eating Disorders. 39(1):49-54. Wonderlich SA, Crosby RD, Mitchell JE, de Zwaan M, Engel SG, Connolly K, Flessner C, Redlin J, Markland M, Simonich H, Wright TL, Swanson J, Taheri M. 2006. An empirical analysis of eating disorders and anxiety disorders publications (1980-2000)-part I: research methods. International Journal of Eating Disorders. 39(1):35-48.